At some point over the past few months, a friend of Laura’s mentioned a local female pastor who had a blog that she thought I would enjoy. 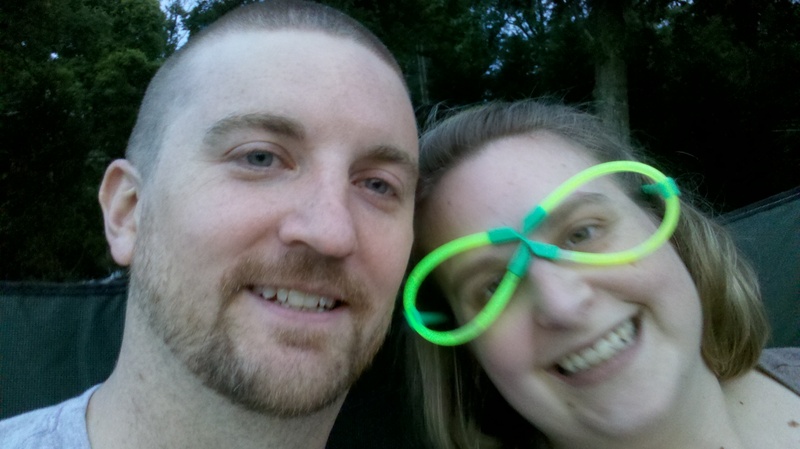 The blog she was referring to was Amy’s Journal that Amy Whatley, pastor of White Oak United Methodist Church, wrote during Easter of this year. I read her blog and decided that including a female-pastored church in the ChurchSurfer journey would be another interesting experience to explore and share, and so here we were in Red Bank ready to check things out. On the way up to the traditional red-brick church building, we saw a man hanging out on the front porch, and as we walked closer he came down the front steps (seemingly too eager to wait for us to go up the steps to him) and greeted us enthusiastically, walking us back up the steps to the porch and engaging us in conversation the whole way. The man’s name was Tony, and he recognized me and greeted me by name (quite impressive), stating that he was the Facebook page administrator for the church and he remembered me from when I had “liked” the White Oak Facebook page the previous day. After a short conversation, Tony pointed us into the sanctuary, and we exchanged a few quick greetings and handshakes on our way through the lobby. The sanctuary of the church was a traditional large white room, with wooden cushioned pews, and a white pulpit trimmed in natural wood. There were large pastel stained glass windows down the walls and an altar table in front of the pulpit with a vase of flowers and two candles. As we sat down in a pew near the front, Laura and I chuckled after hearing an enthusiastic “mornin’ ladies” come from an elderly man with a walker as he greeted a group of women on his way down the aisle. A few moments later we were greeted by a man named Robert, who my wife had recognized from his picture on the “new members” cork board in the hallway, and who we later learned was the husband of the pastor. There was plenty of conversation around the room and we had received a cheerful welcome by Tony, Robert, and quite a few others, which always helps us feel a little more connected to the churches we visit. Worship time was beginning and the choir filed in to the pulpit in green robes and the worship leader kicked off the morning with “America” on the piano. We sang a few piano-driven hymns, which were not necessarily played in the traditional sort of way, but more like a modern piano arrangement, like you would expect from a Billy Joel or Elton John song (that’s probably not a very good comparison, but the best that comes to mind right now). During worship time there were also segments for announcements from Pastor Amy, celebrations and praises from the congregation, the Happy Birthday Song for Hazel (probably one of those ladies that everyone in the church knows), prayer requests, and personal greetings (during which Pastor Amy came down to introduce herself to us). Worship time was closed out with the collection of offerings, which was accompanied by “America the Beautiful” on the piano, and then a choir solo. I assumed this was not a typical Sunday experience for this church, being a holiday weekend which probably results in low attendance and I also noticed a drum kit on stage that went unused. I hardly missed any other instrumentation with the spirited piano playing from the worship leader, and resolved that sometimes less is more. Pastor Amy came up and led the congregation in some responsive readings and the Lord’s Prayer, both of which are United Methodist traditions (and ones that I particularly like), and then began her sermon on Rebekah from Genesis 24. Her sermon had excellent points as she went through the narrative about how Rebekah came to be selected and then agreed to be married to Isaac, but I could definitely tell the sermon was taught from a woman’s perspective. She spoke more about the relationships and feelings that the people in this Scripture had, rather than the actual events and their implications. She also made use of her witty humor to stay engaged with the congregation, while also focusing in on some key life lessons such as…godly men should be looking for a queen to marry, not a princess, and people seeking a relationship or marriage should work on becoming a good potential mate rather than trying to find someone who fits you the way you are. Pastor Amy also related these lessons to the church, pointing out that we should all “be the church” and take action when we see something that is missing, such as a particular Bible study topic, a child-care program, or a community service opportunity. She called on the congregation to “love the one you’re with” and invest themselves in making White Oak United Methodist a better place. One of the consistent topics I have heard over and over again throughout the year resurfaced yet again as Pastor Amy dismissed the current culture of consumerism and how it plays into the way people “church shop” for a church home by what it has to offer them. This, in my own opinion, should not be the deciding factor in where we choose to worship, which should instead be the result of prayer for guidance from the Holy Spirit to be led to a church that you can best serve with your spiritual gifts and talents, and where you can be fed through real relationships. My opinion is that authentic worship is more in our control and can be achieved no matter what church we attend (although I do admit there are certain tastes and preferences at play there as well). At the close of the service the congregation was offered communion, which was a huge blessing for me since for some reason it felt like it had been forever since the last time communion was offered at a church service I had attended. The pews filed down to the front and knelt side by side in all the available spaces at the altar rail around the pulpit and those serving communion offered a pinch of bread into our cupped hands, which we then dipped into the cup and ate, remembering the body and blood of our Lord Jesus Christ which was sacrificed as payment for our sins. We returned to our seats and prayed silently for a few minutes before being dismissed with a blessing. 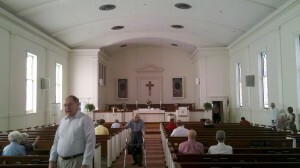 On our way out of the service, we were again greeted and thanked for attending by many of the church members. As we were headed out the door I told Pastor Amy that I would appreciate the opportunity to have coffee or lunch together at some point during the week so that I could get to know a little more about the church and her history, and was surprised when she replied “well what are you doing right now?” Laura and I did not have any lunch plans so we happily joined Amy and Robert for lunch at a Mexican restaurant just down the street. One of the things that I always notice while going from church to church is how easy or difficult it is to connect with the pastor (I usually leave a visitor card explaining that I write a blog about local churches and would like to speak to them in person, or if I have the chance to speak to them before or after the service I bring it up right then). Some pastors have been very interested in meeting and talking with me, others have seemed unsure of why I want to meet with them, instead offering to speak by phone, and others have been (sadly) downright unapproachable and seemed to have the attitude that a meeting with the pastor is some kind of special privilege for important people. Believe it or not, Amy was the first pastor that has offered to share a meal that same day, which we gladly accepted and thoroughly enjoyed. She showed not only through her sermon but by her actions also, that we can all “be the church” by seeking opportunities to engage new people and see where it leads. I will leave the debate of whether or not it is Biblical to allow women to serve as pastors to be held in another forum dedicated to theology and doctrine (I am sorry to disappoint you if you were hoping for my thoughts on that matter). 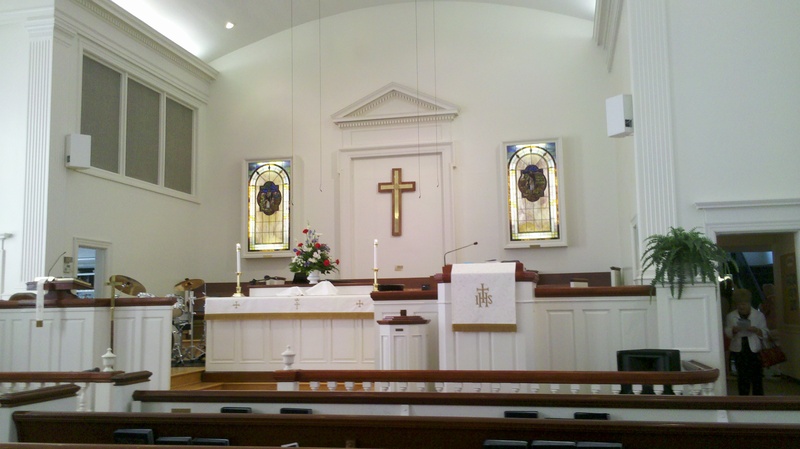 The ChurchSurfer blog is about personal experiences and people, and I am happy to say that at White Oak United Methodist Church I was blessed with some new friends…thanks Amy, Robert, Tony, and all the other fine people we met. May the blessings of the Lord Jesus Christ be with you! Thank you for such an encouraging response. I hope you find what you desire in this journey through the congregations– what an interesting project! In the meantime, I’ll be following to share your experiences through the week. We enjoyed our time with you– especially “the post game show” (what Tony calls having lunch together after church). Tony does an excellent job of supporting our media presence. I bet that you were also greeted by ushers, Bill and Ed. Glad to hear you had a warm welcome. 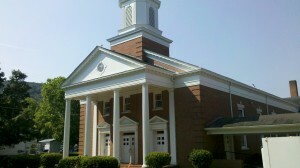 White Oak UMC is a new experience for husband, Robert. He’s always attended large membership churches. White Oak is the first mid to small congregation he’s experienced. Robert told us that he’s always assumed there would be nothing for him in the small church, but found quite the opposite to be true. It is a warm and welcoming place, but also open to new folk and new ministry. It’s a nice balance and a rare mix in my experience. I’ve quoted your estimation of my emphasis on emotion and relationships! YOU GOT IT! Glad someone did– may show more people could be hearing it. Through the summer, I’ve made a switch to a style of preaching that is new for me and a bit difficult too. With prayer and encouragement from other preachers, I’ve shifted from a purer narrative style to a more rubber-meets-the-road response to relationship needs. The summer series follows the alternative lectionary readings in Genesis and really lends itself to the subject of how not to be in relationship (ex. today was Esau and Jacob) and God’s artful working through and despite our struggles and broken natures to create wholeness. It’s not my favorite style, but I think, whatever your work, you should push yourself and explore new styles. In light of your extensive blog work, I dare say you would agree. Well, life is kinda crazy here at the church house, and I hope this response makes sense. Receptions, missions, and services, oh my! I’d best be signing off and suiting up for Second Sunday Celebration. Love to Laura! Peace of Christ to you both as you continue the second half!